The United Methodist Church of the Cross was officially organized in February of 1895 by the United Brethren in Christ. There were several locations that the people met before building on property at 231 South Ninth Street which became the home of the First Evangelical United Brethren Church of Salina, Kansas. This church was the home of several families in the Salina area and welcomed many of the airmen who trained at Schilling Air Base to serve their country during war times. The congregation became known for leadership of women who helped develop strong youth programs, musical programs and many choirs. Eventually the church outgrew the walls of its building with a membership of 320 and an average attendance of 175 in 1941. A site was purchased near the intersection of the Highway 81 bypass (Broadway) and Cloud Streets to construct a new church. Ground was broken on May 15, 1960 with Bishop L.L. Baughman in attendance. This was the last official act of the Bishop as he was welcomed to his eternal home on that same evening. The sanctuary, education rooms and administrative offices were dedicated on April 16, 1961. A new parsonage was built and occupied on Coronado Street by November of 1960. The additioin of more class rooms, a kitchen and the fellowship hall were dedicated on December 12, 1965. Rev. Walther Brant was credited with providing the leadership to accomplish the task of building a new church building and helping the people to develop strong ministries in this new setting. Knowing that the Evangelical United Brethren Church and the Methodist Episcopal Church were going to merge, the new name selected for this new church was the United Methodist Church of the Cross of Salina, Kansas. In 1967, Rev. Alyois Holst was appointed to Church of the Cross which was a return to home of sorts. "Aullie' had attended the original Evangelical United Brethren Church while training at Smoky Hill Air Force Base. Aullie's ministry had a strong impact on the people of the church for many years to come. The church has experienced periods of growth, both physically and spiritually. The Webster Room was added as a place for people to gather and to celebrate the blessings of community. The original courtyard has been enclosed and added as an area for study and administrative duties. Rev. Paul Wilke brought the addition of technology into worship along with strong congregational leadership skills so that the people could be 'equipped for ministry' in the name of our Lord. 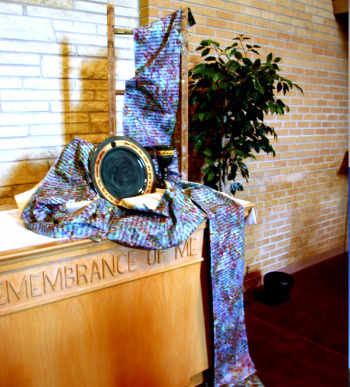 Salina United Methodist Church of the Cross continues to celebrate the Saints who have laid the ground work for ministry that is still creating relationships between God and the people of Salina and the world. We give thanks for those who have come and for those who will come and provide leadership that the gospel of Jesus Christ will be proclaimed and people's lives will continue to be transformed through Knowing, Loving and Serving God.